Tonight we face top East of Scotland side Lothian Thistle Hutchison Vale at the Oriam, in the East of Scotland Cup Semi-Final. LTHV had a fantastic season last year, going toe to toe with Kelty Hearts, missing out on a last day winner takes all showdown at Kelty on the final day. They also had a great Scottish Cup run, eliminating Stirling Albion, before losing out to St Mirren in Round 3. Raymond Carr’s men are in EoS Conference B along with former Junior giants Bo’Ness United and Bonnyrigg Rose. 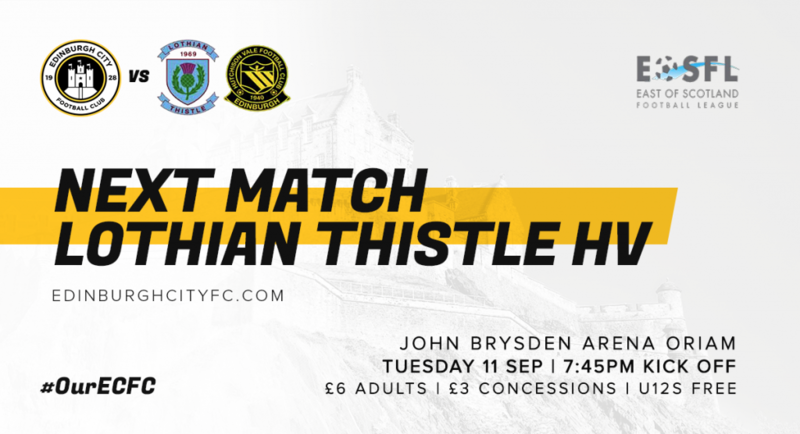 The match is on neurtral ground at the John Brysden Arena at the Oriam; admission prices are £6 for adults, £3 for concessions with under 12s free with an accompanying adult; a cash gate will be in operation. With our focus on keeping active at the top of the league, we are likely to rotate the squad and some of our under 20s will feature too. Whilst we have no recent league meetings again LTHV, they did defeat City in the final of this competition in 2016, running out 2-1 winners at Meadowbank Stadium to lift the famous old trophy. The winners of tonight’s match will play East Kilbride in the final, after they defeated Berwick Rangers in their tie.